A new era of business education at Tulane University has begun. In January, the Goldring/Woldenberg Business Complex — the new home of the A. 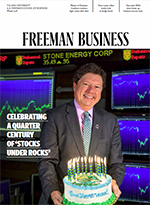 B. Freeman School of Business — opened its doors to students. Connecting students with alumni in the field was a guiding principle behind the intersession courses, a new series of intensive seminars offered between the fall and spring semesters. Live from New Orleans, it’s accounting class! Comedy isn’t something you typically associate with accounting, but Tim West isn’t your typical accounting professor. In addition to holding a PhD in accounting, West is a graduate of the Second City and he regularly incorporates improv exercises into his courses. The 2016 presidential election exposed deep fissures within U.S. society, but in an appearance at the Freeman School, economist Roger W. Ferguson Jr. said today’s economic and cultural divide has historical precedents. Lydia Winkler (MBA/JD ’19) and Marco Nelson (MBA ’19) are the creators of RentCheck, a new rental inspection app that could revolutionize how lease agreements are managed. The A. B. Freeman School of Business at Tulane University honored business executive Patrick Comer as Tulane Distinguished Entrepreneur of the Year and civic activist Sandy Rosenthal (MBA ’81) as Tulane Outstanding Social Entrepreneur of the Year at the 2018 Albert Lepage Center for Entrepreneurship and Innovation Awards Gala. A health-care startup with an innovative device to help people breathe a little easier was the big winner at the 18th annual Tulane Business Model Competition. The contest, an annual presentation of the Freeman School’s Albert Lepage Center for Entrepreneurship and Innovation, took place on April 19 at the business school. Assistant Professor of Accounting Paddy Sivadasan and Assistant Professor of Finance Xuhui “Nick” Pan were honored with the 2017 Dean’s Excellence in Teaching Awards, the Freeman School’s highest accolade for classroom instruction. The 2018 edition of New Orleans Entrepreneur Week featured nearly a dozen different pitch contests for ambitious entrepreneurs, but it was a team of MBA students from the Freeman School who took home the week’s first prize. In January, the Freeman community came together to celebrate Gus De Franco’s investiture as Tulane University’s first KPMG Professor of Accounting.